After having spent almost a decade photographing the cats, I decided it was time to capture some apes on film; armed with that will I stepped out into the land I had only read about in Dian Fosse’s books : The Land of Volcanoes. 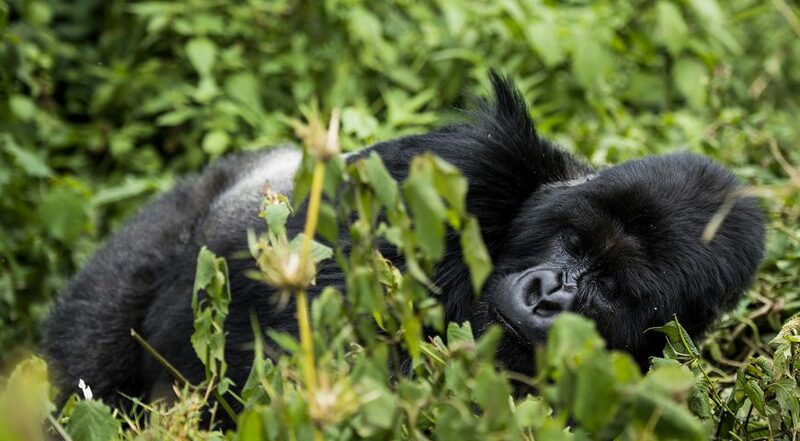 A slice of undisturbed forest lies shared between the borders of Uganda and Rwanda; and is home to the last living population of the largest terrestrial mammal : the Silverback Gorilla. The name derived from the silver streak present on the back of a mature male and is nothing short of a spectacle. I admit I had trouble concealing my excitement when a bunch of friends first invited me for a short trip to Rwanda, and I jumped at the mere thought of visiting and seeing the giants up close. Over the days leading up to the trip I had a million questions, but one what it would be like to look into the eyes of a Gorilla. I was about to find out..
We landed in Kigali and drove past one of the most beautiful countrysides have seen; I believe to own coffee plantations right by the backyard of your house is almost like owning your own slice of heaven. Eucalyptus dominates the landscape and our lodge was nested cozily on top of a hill, with lush green grass and tall trees. The next day early morning we headed out to the main Park Office, where we were allocated the trekking route for the Umubano family. The Park is home to multiple families, and depending on the group (size, fitness, etc) routes are allocated. Once the permits were done, we chose our guide and he started communicating with the trackers and thus we set out. We drove for a bit until we came close the inner park boundary made of stones; on the way the guide kept sharing knowledge about the landscape and traditional practices. The trek wasn’t very long but felt strenuous considering the extremely high humidity level. Our guide proceeded then to brief us about the rules and regulations of the forest; little tid-bits about the behavior of the apes and lastly and most importantly what to do in case we had a close encounter with a Gorilla! We had located the group and our guide approached the dominant Silverback alone, while we watched from the distance. The guide spoke in the animal tongue, asking permission to be around the group. The request was accepted; the guide explained that one cannot venture into the area or close to the group unless the Silverback allows it. He also showed us hand gestures to demonstrate that we were friends, whenever we saw a Gorilla close-by. The Silverback stayed a bit aloof, while the family and younger males lay in the bushes close-by. We spotted a few babies being nursed by the mothers, who seemed to be protective and rather squeamish. The males were pretty relaxed, and lay in the bushes either resting or feeding. As we neared despite our protection gloves, I could feel the minor jabs of the nettles and I wondered how effortlessly the Gorillas fed on it. I found one of the young males resting nearby and I sat photographing him; almost too soon it was time for us to go back. On the way back I was still trying to wrap my head around the marvelous sights of these Gentle Giants, walking through the bushes, playing, sleeping, just being relaxed.